Will Video Poker Make me Rich? I live about an hour or so from Atlantic City. I only realized I lived that close about three years ago. Usually, if I headed to the beach, I headed to the water and sand and never gave a thought about the bright lights of the casinos, so I sort of forgot the entire city was even there. One Saturday morning, my husband suggested that we take a ride to Atlantic City and have some fun. I am always up for an adventure, so I was intrigued. I wasn’t exactly sure what I would play in the casino. I knew how to play poker; I played in college, but it was a very low stress game. The games were always coed, and if you were a player of the female persuasion and you lost, you only had to put on a sad face and the guys would worry that you were going to cry, so they would just say “Oh, forget it, you don’t have to pay me.” I went three years without losing a dime in poker. It was not a good training camp for the real game. You can understand why, with my poker background, I didn’t want to play with “pros” in the casino. I just think a sad face would not work on the real poker crowd plus I never developed a knack for the whole check, call, and raise process. So, my husband told me about video poker, and I thought this is something I could get into. We went to one of the Trump casinos, and when we got inside, my husband wanted to go to the black jack tables. I sent him on his merry way, so I could explore. 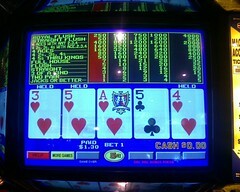 I found this fun video poker game that spun like the slot machines. A nice gentleman offered me a seat next to him and gave me a quick lesson on “Spin Poker”. I inserted a $20 bill, and my first hand popped up. I selected the cards I wanted to play; I hit spin, and I got four aces. I decided I liked this game. When the aces hit, I made sure I didn’t scream or carry on, but unintentionally, I let out a little squeal. Unfortunately, an old witch on the opposite side of my new gentleman friend complained out loud at my showy and inconsiderate emotion. I am not calling her a witch because she was mean (which she was). I am calling her a witch because she had all these little troll dolls and voodoo things lined up on top of her machine and kept asking them to help her. Until that day, I was unaware that there was a deity devoted to gambling. I must have missed that chapter in catechism class. Yes, there we had it. Another marriage made in heaven. With that stunning revelation, I decided to call my husband and tell him of my windfall. The machine was still tallying my total when I saw my husband coming up the escalator. The precise number came to be $2,550 when all was said and done. I have to admit that I was pretty happy. The old witch stormed off, and her husband let her, and the casino people came over and congratulated me. It was lots of fun. Once, I had the cash in hand, I took my winnings over to the Coach store in the nearby mall. There, I bought my daughter’s Christmas present with some of the winnings and treated my husband to lunch at a nice restaurant that overlooked the water. When I got home, I socked the rest of the cash in the bank. Later, I called my Dad and told him that I had won, and after warm congratulations, he warned me that people do not win all the time, but guess what? I went back three more times in the next six months and won each time: $250, $400 and $800. However, the fourth time we went back, the spell was broken and I lost. The magic of the spin video poker game died, and I have not wanted to go back since. Will I go again? I guess. It’s not anything I feel an urgency to do, but maybe when we head to the beach for a day, we will swing past Atlantic City and I can take another stab at winning our millions. Someone has to win, so why not me? 4 Responses to Will Video Poker Make me Rich? Can I call 1-800-SLOTWHORE? Just asking. :p “Ignore the old bat and enjoy the win! Besides, she’s my wife.” – Hilarious! And all true Jack – all true!